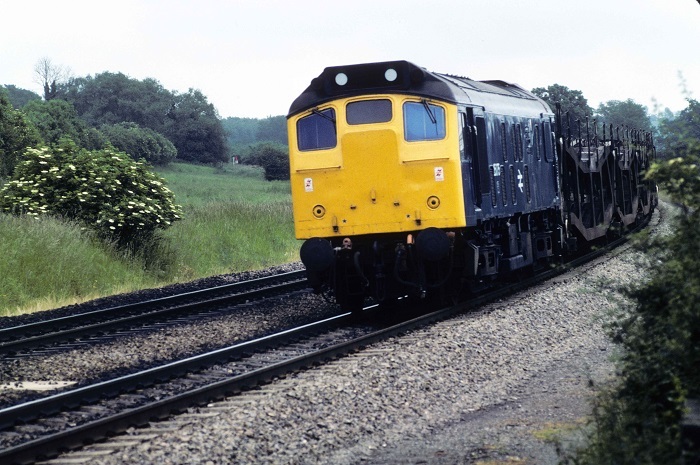 Photograph courtesy Roger Geach Its June 19th 1981 as 25075 hurries a Cowley - Bescot working through Heyford. The nineteen year eight month career for D5225/25075 saw much time spent allocated to London Midland Region depots in London and the Midlands in addition to three and a half years on the Scottish Region. Time between last Classified repair and withdrawal: 33 months. January 1964 to Nottingham (16D). May 1964 to Leicester (15A). February 1968 to London Division (D14). Renumbered December 12th 1974 (the last Class 25 to be renumbered). 25075 was the 169th Class 25 withdrawn, one of five retired during March 1983. After withdrawal 25075 was stored at Cricklewood until moved to Acton on May 5th 1985 (see details below) and reaching Swindon Works on May 15th 1985. The Works closed before 25075 could be broken up, on May 26th 1987 25075 moved to Cocklebury Yard, then to Hinksey Yard, Oxford on June 2nd 1987 and to Vic Berry's yard by June 11th 1987. By the first week of July 1987 25075 had been broken up although the cabs lingered for a while longer. 25075, 25219, 25306/326 Cricklewood – Swindon May 3rd – 14th 1985. 25027/75, 25123/133/144/158, 25228/234, 97202, 40046/63 Swindon Works - Cocklebury Yard – Vic Berry, Leicester May 26th - June 11th 1987, by 20019 & 20197 (Oxford – Leicester). Noted Derby Works June/August/October 1974. Noted Glasgow Works April - June 1980 (Intermediate repair). Noted Derby Works October 1981 (N6 repairs). Condition as delivered from Darlington: green livery, small yellow warning panels, curved upper corners, frame level stripe appears not to be covered by the yellow panel. D5225's first recorded passenger working took place on August 13th 1965 working the 18.20 Nottingham - St. Pancras throughout. On April 13th D5225 (or D5228?) and a maroon inspection saloon were noted on the Derby - Matlock line. On August 26th D5225 worked the summer dated roundtrip Nottingham - Llandudno Town with D5247. Condition date uncertain: green livery with small yellow warning panels, curved upper corners, warning panel covers frame level stripe, straight sided sandboxes, three-rung bogie mounted footsteps. Condition September: green livery with small yellow warning panels, squared upper corners, exhaust located over engine room, hand/footholds still present, no blanking plates. Photograph courtesy Graham Wareham Class 25/1 No.5225 at Cambridge Street during April 1969. A school charter on February 24th 1970 saw 5225 & 5248 (also reported 5236) work the outward leg of a Leicester - Southampton Docks service. May 29th saw the summer dated roundtrip Nottingham - Llandudno Town service in the hands of 5225 and 5236 (still green livery). Condition May: blue/yellow livery, gangway doors still in place, exhaust above engineroom, two-rung bogie footsteps, no blanking plates. On June 24th 1972 5225 worked the 14.40 Blackpool North - Leicester from Nottingham. 5225 & 5260 were noted on Exeter stabling point on November 3rd displaying headcode 6V65, possibly having arrived with a sugar beet special. The 20.43 Birmingham New Street - Peterborough was worked by 5225 on February 4th 1973. A Nottingham - Yarmouth day excursion was worked out and back by 5225 & 5272 on May 27th. On a very wet June 2nd (a wet day) the roundtrip Nottingham - Llandudno was worked by 5225. The lack of a diesel multiple unit on June 13th saw 5225 and coaching stock work a midday roundtrip (?) Stourbridge Junction - Worcester Shrub Hill. A football special on September 8th saw 5225 & 5223 work a roundtrip Leicester - Kings Cross. As the year closed, according to official records 5225 became the last Class 25 to receive its TOPS number, 25075. On April 3rd the 17.00 Derby - Matlock and 17.50 return was worked by 25075. 25075 & 37192 were noted passing through Lincoln on June 19th with a freight for Whitemoor. 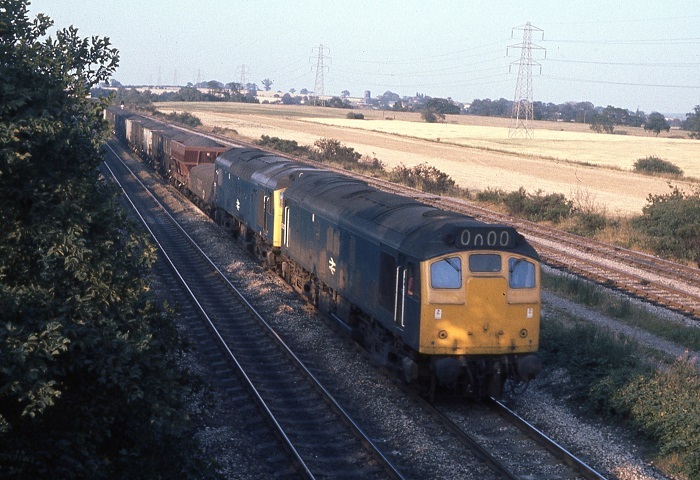 On July 12th 25075 & 25269 worked a relief Derby - Yarmouth to ? ?, 25075 was noted later that day failed on Norwich depot. On August 29th 25075 & 25037 worked the 19.45 Skegness - Derby (did they work the outward leg?). 25075 managed another roundtrip on the Derby - Matlock service on September 2nd during the early morning. 1976 produced a number of visits to the east coast seasiode resorts, starting on May 29th with 25075 & 25210 working the Walsall - Norwich (for Yarmouth) - Derby diagram. The same diagram was repeated on July 3rd with 25046. On the warm summer evenings after work a couple of hours were spent lineside at Stenson Junction before making for one of the fine local pubs. 25075 & 25117 with brake tender head towards Burton with a train of loaded coke hoppers, July 6th 1976. Derby - Skegness roundtrips (?) were worked on August 2nd with 25130, August 29th with 25037 (relief), August 30th with 25280 (relief), whilst on October 2nd a roundtrip day excursion from Burton on Trent to Blackpool North was worked by 25075 & 25076. An Irlam - Skegness mystery excursion on April 9th 1977 was worked by 25075 & 25057 for a total 316 miles, the arrival was 90 minutes late suggesting a failure possibly en route. Two days later on April 11th the same pair worked a Liverpool - Bangor day excursion. The start of the summer timetable in May saw 25075 transferred to Haymarket. On October 20th the 21.40 Edinburgh - Carstairs was worked by 25075. On March 25th 25075 worked the 08.55 Edinburgh - Aberdeen. The 21.40 Edinburgh - Carstairs was worked by 25075 on June 13th and the 17.10 Edinburgh - Cardenden with six coaches on July 17th. An early evening Glasgow Queen Street - Dundee service was worked on October 7th, whilst two days later on October 9th it was the turn of the 21.40 Edinburgh - Carstairs. The 09.50 Birmingham New Street - Edinburgh was worked from Carstairs by 25075 on August 25th 1979, five days later (August 30th) 25075 was back on the 21.40 Edinburgh - Carstairs. On October 1st 25075 worked the 06.40 Glasgow Queen Street - Dundee. On October 6th 25075 had quite an adventure working a nine coach SRPS 'Northern Belle' railtour from Falkirk Grahamston to Keighley via the Settle & Carlisle. On the return Carlisle was reached forty minutes late, 47040 being added for the run into Scotland. Because of the vintage rolling stock in this train the maximum speed limit was 60mph. 25075 was noted working the Glasgow Queen Street - Dundee route on June 17th with 27034, on June 25th with 27023 and on July 15th by itself. On July 29th 25075 worked the 07.40 Edinburgh - Glasgow Queen Street. More workings on the Glasgow Queen Street - Dundee services followed, on September 14th & 15th by itself. On September 27th 25075 worked the 17.20 Dundee - Edinburgh. During November 25075 was transferred to Bescot. On February 22nd & March 1st 25075 was assisting passenger workings between Euston & Stonebridge Park due to the power being off for engineering work. A Bridgnorth - Paddington day excursion on March 14th (also recorded as February 14th) was worked forward from Bewdley to Paddington by 25075 & 25067, they did not work the return leg. The month of May produced a variety of workings starting with the 10.15 Birmingham New Street - Norwich and the 15.18 return on May 12th. 25075 returned to this route on May 16th with the 08.05 Birmingham New Street - Norwich. The next day (17th) 25075 was noted at March depot. Two round trips over the Cambrian line to Aberystwyth took place on May 30th & 31st with 25086. On August 8th 25075 worked the summer dated roundtrip Nottingham - Llandudno Town. The early morning Manchester - Newcastle newspapers was worked by 25075 on December 30th. January 29th saw 25075 on the Camp Hill banking duty. The 'Conwayer Crusader' railtour on April 3rd was worked out & back between Llandudno Junction & Blaenau Ffestiniog by 25075 & 47475. 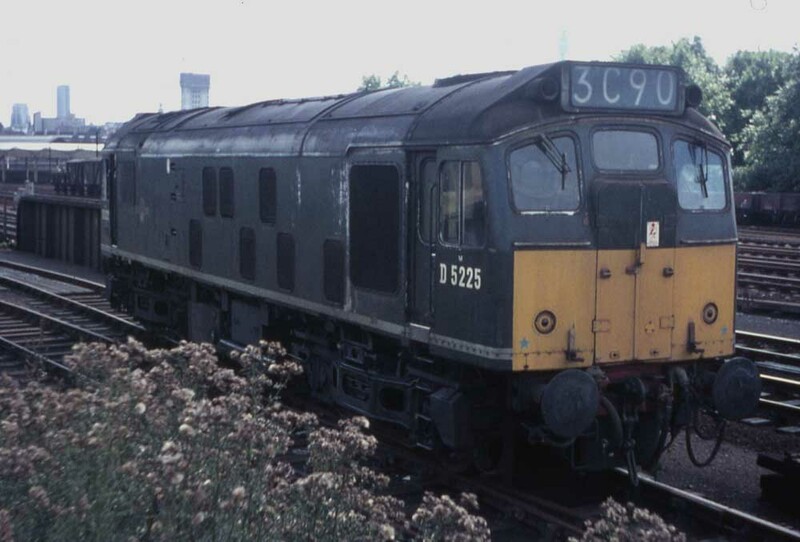 On June 23rd 25075 worked the 15.00 Manchester-Bristol parcel vans, three days later (26th) 25075 was noted southbound through Darlington with a Corkerhill – Chesterton weedkilling train. A busy week commenced on June 28th with 25075 working the 08.57 Leeds - Carlisle and the 15.37 Carlisle - Leeds. This diagram was also worked on June 29th, June 30th & July 1st. Additionally on June 30th 25075 worked the 21.23 Bradford - Kings Cross to Leeds (Doncaster was also quoted). On July 3rd 25075 worked the 10.00 Carlisle - Leeds and 16.05 Leeds - Carlisle. 25075 was withdrawn on March 27th 1983. Page added July 29th 2013.